UN Attempt to Save Jewish Sites from ISIS – Too Little Too Late? Last week, a UNESCO conference was hastily convened at its Paris headquarters to discuss what can be done to preserve what’s left of heritage sites in Iraq and Syria. The iconoclastic jihadists of Islamic State – or Da’esh (ISIS) – had captured a region in northern Iraq which contained 15 percent of Iraq’s registered archaeological sites. Believing that shrines ought to be destroyed lest they encourage idol-worship, they have already blown up or burnt to the ground shrines such as the tombs of Jonah and Seth, Christian churches and Shi’a mosques. Like most UN agencies, UNESCO has blown hot and cold towards Israel and the Jewish people. On the one hand it has admitted Palestine as a member and backed Palestinian claims to Jewish holy sites like Rachel’s tomb. On the other it has named Tel Aviv “creative city for media arts“. On the one hand, it hosted an exhibition on “the Holy Land.” On the other had it insisted that the word Israel not appear in the title and that “politically incorrect” aspects of the Jewish state, like wars and Jewish refugees from Arab lands, were left out. But this time, UNESCO had made a point of including the Jews in its conference. The UNESCO director-general, Irina Bokova, has condemned the destruction in May 2014 of the Jobar synagogue near Damascus, which, legend has it, goes back to the time of Elijah the Prophet. When a JJAC delegation, accompanied by CRIF, the body representing French Jews, submitted a list of 100 endangered Jewish sites to Mrs Bokova in June, she lent a sympathetic ear. And when Professor Shmuel Moreh, who has worked long and hard for the preservation of ancient Jewish sites in Iraq made his case, Mrs Bokova – or her aides – were listening. Professor Moreh was flown over from Israel to be a special guest at the conference, along with representatives of Kurds, Assyrians, Turkmen and Yazidis. A conflict against culture is by extension an effort to erase the identity of a people, especially vulnerable non-Muslim minorities. No doubt, Irina Bokova’s heart is in the right place, but when I arrived in the imposing glass and concrete building, the institutional bias was there in subtle ways. An exhibition of photographs in the foyer called “Palestine and Jerusalem” marked “International Year of Solidarity with the Palestinian people”. The photographs were taken by the French order of the Dominican friars at the turn of the 20th century. To judge by the images on display, Palestine was a pastoral land of monasteries and Arab shepherds, processions of Muslim and Christian pilgrims. Not a Jew in sight – yet we know that Jerusalem then had a Jewish majority. So much for not “erasing a people’s identity”. Mrs Bokova opened the proceedings by thanking Kuwait and Saudi Arabia for funding the conference. (No one appreciated the irony that Saudi Arabia had not exactly preserved its own heritage itself – having destroyed Muhammed’s house and other ancient sites). In both Syria and Iraq, she observed, Islamic State have demolished, pillaged and dug up archaeological sites, sometimes with bulldozers, and sold relics on the international black market in order to finance their malevolent deeds. She called for “cultural zones” to be established, starting with the great Umayyad mosque in Aleppo. Conference speaker after speaker called for good neighbourliness and respect. The UNESCO motto was a mantra: “It is in the minds of men that the defences of peace must be constructed.” Education was the answer. A cynic might ask: what planet do they live on? “Cultural zones” when people were starving? “Civic identity to be built from the bottom up” when people were being beheaded? “Good neighborliness and respect” when people were being sold into slavery? One Syrian parliamentarian called for refugees to return from exile to claim their heritage. But when the neighbors have been ethnically cleansed, as the Jews had been from Syria and Iraq, with no prospect of return, who will speak up for their heritage? Who would ensure that when the time came to rehabilitate and renovate, traditional Jewish shrines such as the most revered of all, Ezekiel’s tomb, would not be turned into mosques? It was already happening. The Hebrew inscriptions had been removed from the renovated tomb of Joshua the High Priest near Baghdad. 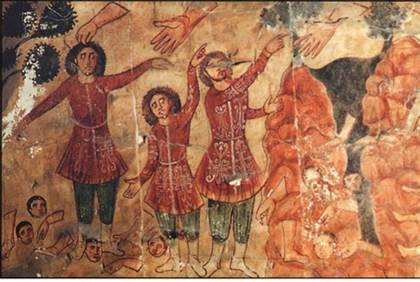 Loudspeakers had already been affixed to Ezekiel’s tomb, and Koranic inscriptions hung on the walls. Who would ensure that the original character of the shrine would be retained? And if objects stolen from minority communities are recovered in the West, why should they be sent back to the Syrian or Iraqi governments? As the saga of the Iraqi-Jewish archive demonstrated – the personal possessions and mementos confiscated from their Jewish owners by Saddam Hussein and shipped for restoration to the US – they should be restituted not to governments, but to the community which has been displaced. Beyond the expression of high-minded sentiments, none of these questions were answered. In one important respect the conference might achieve results: museum chiefs declared they would treat with suspicion any artifacts offered to them from the Middle East, and would conduct “due diligence” checks as far as possible. But private collectors were less likely to be circumspect about the provenance of items. The international art market was a vessel too leaky to render watertight. It is tempting to conclude that organisations like UNESCO, which were founded on the pillars of intergovernmental law, seem well past their sell-by date in a world where non-state actors ride roughshod over “kaffir” international treaties and conventions. Even before the era of Islamic state, neither Syria nor Iraq were signatories to the 1954 Hague Convention for the Protection of Cultural Property in the event of armed conflict.